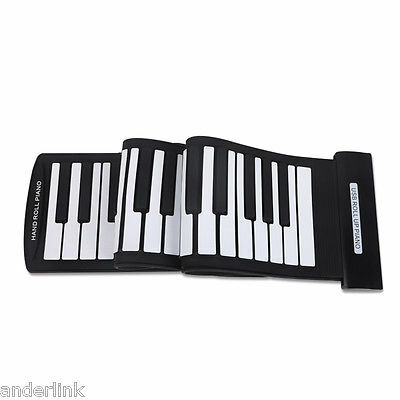 Thank you for choosing this USB MIDI Roll-Up Piano. This stylish USB MIDI Roll-Up Piano uses modern science and technology and electrical industrial innovation design. We sincerely hope that it will give full play to your musical talent, and bring your immense joy and wonderful experience. 1. Before using, please install the product software; 2. Shall be connected to a computer to work; 3. Shall produce sound through computer sound card. 61 Keys Professional MIDI Keyboard. Portable, fashionable, concise, easy to carry. Playing, recording and editing your music become more easy. Limitless professional tone and effect resources. Use the USB port to connect the product with a computer, no additional power is needed. Compatible with Win XP/Vista/7 and Mac OSX, without drive, supporting hot plug. Compatible with Cakewalk, Sonar, Cubase, Nuendo, etc major sequencer software and VST/VSTi. Don't use the piano in a wet, high temperature or dusty area. Keep the keyboard level when in use. Do not place the piano near areas with strong electric waves. Do not place the heavy objects on the product, to avoid impacting of the collision. Do not pull or twist the body or keyboard with 90°. It may damage the functions. Do not tamper with the wiring of this product with a cutter or other sharp tools, or it may damage the functions. When rolling up the keyboard after use, do not roll it too tight. Please read the instruction manual carefully in advance to ensure proper operation.